SuSi - Super Simple - is a small, simple glider; a so called ‘mini wing’ with maximum of performance and incredibly easy flying characteristics. These characteristics make the SuSi2 the perfect tool for hike & fly. You have the glide performance for crossing valleys and can thermal with ease whilst still dealing with more difficult conditions and strong winds. The most outstanding characteristics of the SuSi2 are surely the performance on glide, the wide speed-range, high stability, comfortable feedback in turbulence, easy take-off behaviour and the agile yet controllable handling. All these characteristics make thermalling and dynamic manoeuvres easy. Moreover, the SuSi2 is very small to pack and extremely light. By implementing our Razor Edge technology, we were able to increase the glide-ratio by one full digit. SuSi2’s predecessor already proved its strength in various competitions such as the Red Bull Dolomitenmann and the Red Bull Elements. 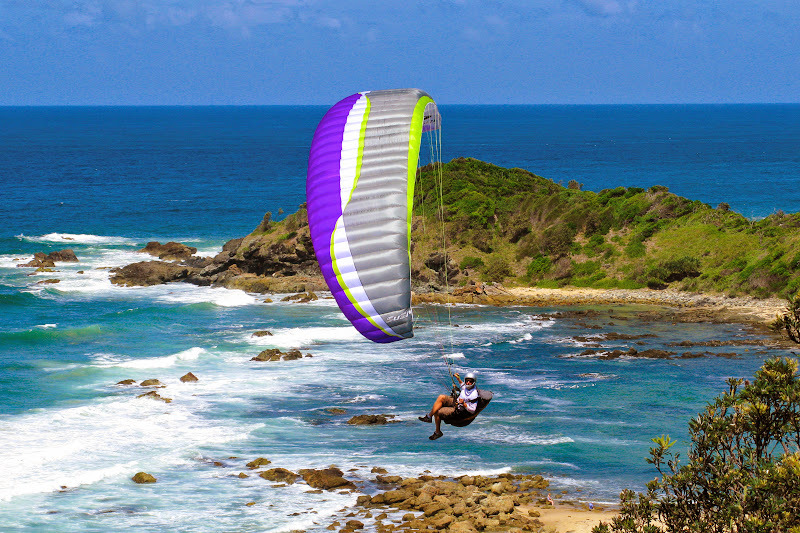 With the increased glide, the SuSi2 set’s a new standard in this glider category. 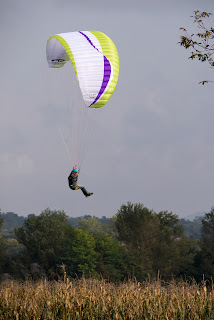 SuSi2 doesn't only perform better; its flying behaviour is even more comfortable. Exhibiting no nervous pitching, which often occurs with mini-wings, the glider dampens turbulence significantly and flying becomes stress free. We call this the AirDesign Comfort-in-Flight. This makes the SuSi2 is attractive to a wide range of pilots. 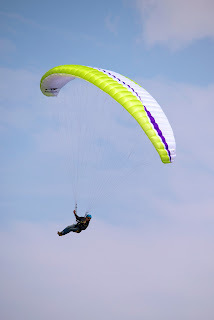 - For hike & fly pilots as an alternative to a standard paraglider wing. Due to it´s small size and light weight SuSi2 has a very small packing volume. With its excellent glide performance, new terrain can be explored. - Dynamic Free Flying - More and more pilots get into asymmetrics, barrel rolls etc. SuSi2 with its great agility and direct handling is a fun package. - Strong-Wind Soaring - Thanks to the higher trim speed, SuSi pilots are still able to fly, while others have to remain on the ground. Also in normal conditions, SuSi2 has great thermal abilities. Size 20 is our 'entry' level SuSi2, suitable for newcomers to mini-wings and for heavy pilots. We consider size 18 the standard size of SuSi2. It is perfectly suitable for most experienced pilots. Size 16 is another 4 km/h faster. It exhibits more energy in turns and dynamic manoeuvres. It is suited for experts or very light pilots. Size 14 is the extreme wing with very high speed and the shortest brake travel. We recommend it to expert pilots only. To help choose the right size, the following table gives an overview of the speed ranges with different weight loadings. This might be helpful for choosing the right size. The sail and internal ribs of SuSi 2 Superlight gliders are made of double coated Porcher Skytex 27 with the leading edge manufactured from the more robust Dominico 30 D. To further reduce weight, 12mm lightweight risers and Edelrid unsheathed lines are used. To maximise glide, take hold of the C-risers at around the height of the maillons and pull down gently (~3cm). The glider slows down slightly and the performance increases by half a digit. The C-risers are also very helpful to control the wing on glide. Check out our video section (C-balls). SuSi2 does not have C-balls attached, but by using the risers it is possible to control as described in this video. • The airfoil of SuSi2 was developed especially for this type of wing together with technology developed for our 2-line race gliders. • A new line-layout results in relatively neutral flying characteristics and reduction in total line consumption. • 3-line concept with split D at the upper C-lines. • Nylon rods in the leading edge keep the profile in perfect shape and improve performance and launch characteristics. • 3D Cut: a technical sail cutting method used across the leading edge area. This produces an improved air flow and increased performance. • Performance style reinforced 12mm risers, speed system, adjustable brake handles and dirt-holes at the wing tips complete the quality finish. • Razor Edge: A specially designed, precise trailing edge cutting technique which optimizes the profile and improves the glide substantially. 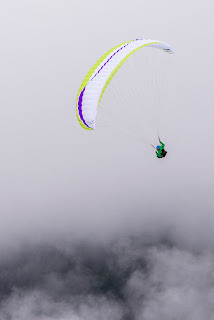 Test flights have proven that SuSi2 has good pitch stability with easy handling for a wing of this type. With only a little brake input, SuSi2 can be turned flat and has an astounding climb for its small size. With more brake input SuSi2 is super agile, super fun and can be turned like a speed glider. SuSi2 responds to brake input directly and quickly builds momentum to make dynamic wing-overs or hook-turns absolutely thrilling! For a wing of this type, SuSi2 has a good glide with around 8 to 8.5, making it comparable with many extra small intermediate paragliders. SuSi2 cuts through turbulence without excessive reaction, absorbing the bumps with minimal pitch or roll. The handling, whilst still active, has been reduced to manageable levels making SuSi2 one of the most comfortable gliders of this type. SuSi2 can be described as a mini-wing, meaning it is a small paraglider with characteristics comparable to a paraglider rather than a speed wing. SuSi2 has an accelerator (speed bar) and no trimmers. It is suitable for thermic flights, mountain descents and soaring – a true multi-purpose paraglider. The SuSi range comes in various sizes from 14m² to 20m². Sizes 14 is load- and shock tested according to EN 926-1. Size 16 and 18 is also type-tested within LTF/EN-D and size 20 is type-tested LTF/EN-C.
• SuSi2 lifts off much earlier than its predecessor and in the air it is more damped pitch and roll wise.